For the first time ever I tried to grow blue hubbard squash. 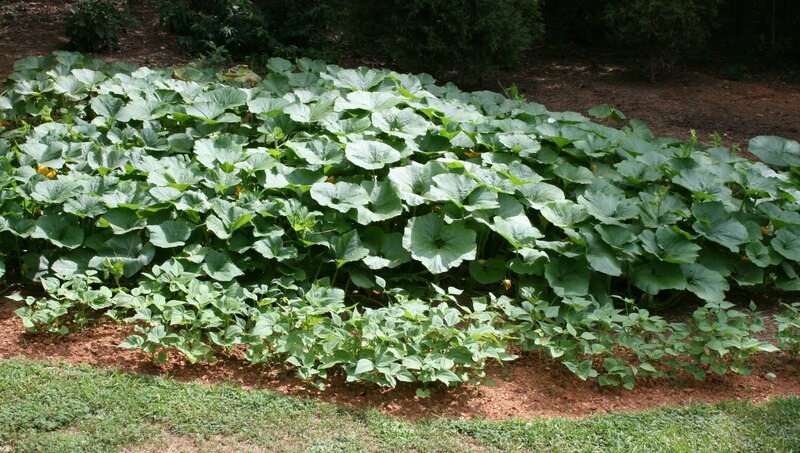 We love winter squash and usually grow butternuts but this year I wanted to grow those huge 20 - 40 pounders too. In early May I made a big mound that had been enriched with lots of compost, rich with aged goat and chicken manure. I watered dutifully and waited for the seedlings to pop their little heads from the soil. After the seeds germinated they grew like weeds with these huge beautiful leaves. And they continued to grew until they over an took area, far larger than I hd anticipated. But that was ok....I wanted those huge squash and it evidently takes a huge area to produce them. In the meantime, I had to wait on the butternuts to go in because we had a tree coming down that needed to be felled right where they were going. The tree man wasn't able to get here for a month so the butternuts were way behind the hubbards going in. The butternut came up and they too and did very well as they always do. Lots and lots of flowers on both. Then I got the little baby fruits on the hubbard. They would get no bigger than a ping pong ball and turn yellow and shrivel up. I wondered if there were enough bee's around and if they were getting pollinated. I still watered, nurtured and waited. 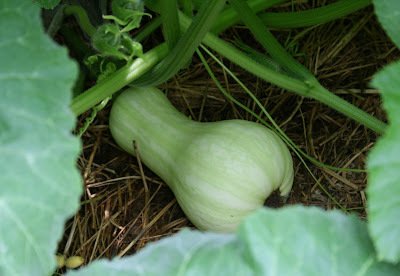 Then the butternuts started getting little baby squashes too. But those were being pollinated because they were going on to be squashes. Hummm....Still I watered and watched. We walked through daily and squashed all the squash bugs we could find. We turned leaves over for eggs and smooshed them too. 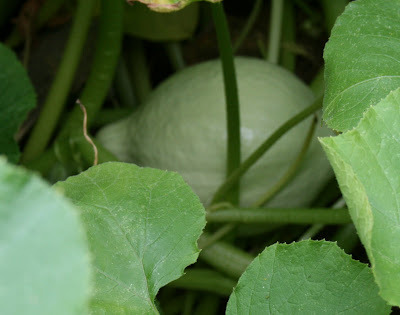 Still, I thought maybe there are no squashes because it's a bigger plant and it was going to take longer. I went and looked in the Johnny seed catalog to see what it said about growing blue hubbard. I only had the current catalog and the seeds had been from the year before but had not been planted until this year. Johnny's catalog said "Sorry, no seed available this year". Ok...they must have had a crop failure and that would have been the same seed I'm not getting to fruit and I'm not going to get any squashes from these plants either this year. I was disappointed. I considered pulling the whole thing out because I could use that area for pea's instead of wasting it on this massive vine that wasn't going to do anything. But I didn't. And then we saw a fruit that didn't turn yellow. Yay...we were going to get at least one. But there were even more. It's got at least a half dozen squashes! So why do I do this to myself every time I grow something new? It starts out so optimistic but somewhere along the line I forget to trust the process. I think I and my influence is more important than it is and that I hold the key to life and death for this plant. I forget that nature isn't quite that fragile and that if I am doing things even half way right nature will take care of the rest. I just need to remember to relax and trust the process. Oh, if I could just remember this next time. I'm doing this too. This is the first time we're doing at our new place and so far everything starts good, but nothing is happening. I'm starting to lose faith in a particular patch, but thanks to your post I'll keep it in and see what happens. thanks! Hi Tory - I'll keep my fingers crossed for you that it turns out as well as it seems to for me when I relax and have patience. This is a beautiful story - and reminder. Thanks for sharing, Elizabeth!